East Sussex WRAS deals with a large number of swans and also work closely with the National Swan Sanctuary based at Shepperton in Surrey. We are often called out to various swan incidents ranging from swans caught in fishing hooks, crash landing on roads or in gardens, sick swans living on unhealthy lakes and incidents of swans flying into overhead power cables. WRAS has been involved in numerous major swan incidents. Juvenile swans are particularly good at crash-landing on roads, fields and in the middle of housing estates. Every year WRAS gets called to 30+ crash landed swans which are landed with a bump on roads or fields. Frequently we get calls from the Police to attend, but when we arrive a well meaning member of the public has walked the swan back to the nearest river or pond. Please DO NOT walk a swan back to a river of lake unless advised to do so. The swan may be able to walk but it could have crashed landed due to being shot - shot wounds are not always easily visible on swans especially air gun wounds. They could have damage to their rib cage or internal organs but still able to walk. It is important that you call for help and advice. On some occasions it is safe to do so, but it is difficult to know unless you are used to checking them over. Swans do not land on roads because they think they are rivers when wet. Swans crash land on various locations not just roads and it is mainly due to turbulence. Different land types give off different heat levels, this can cause turbulence. In areas like Lottbridge Drove, Eastbourne, swans frequently crash due to turbulence, due to the close bands of different ground types - housing, roads, fields, lake, rivers, etc. The juvenile swans are not used to this turbulence and therefore crash land as a result. Swans have a habit of resting either of their legs on their backs. Unfortunately, those who have not seen this before, frequently think the leg is injured as a result. This is mainly to do with heat exchange and rest. Swan have been known to hold a leg on its back for over an hour, even when swimming or being chased by other swans too. As swans get old some of them tend to develop arthritis or other similar conditions in their joints. We do monitor swans (or encourage local people to) when a swan develops this type of condition. However, we do not normally catch and treat this condition unless it is necessary from a safety point of view. If the condition becomes too bad that the swan can hardly walk then we will seek advice from the Swan Sanctuary to see whether a more suitable and/or treatment is necessary. Swans can develop injured legs for a number of different reasons. Legs which are clearly injured with blood and a clear fracture with bone showing are obviously conditions which require our attention as soon as possible. Fishing Line and hooks in legs, are fairly easy to deal with as long as the swan does not fly off. Hooks and line can be easily removed. Swans with line, elastic bands, plastic etc which is applying pressure to a leg should NOT have the line, band or plastic cut off and the swan just released - these casualties MUST be observed for 24 hours (at least) and checked to ensure that the area beneath where the pressure was applied does not die off and cause a potentially fatal injury or wound. Limps are common in swan leg call-outs. Sometimes these are to do with old age, other could be to do with infections in the joints or even foreign objects stuck in the feet. 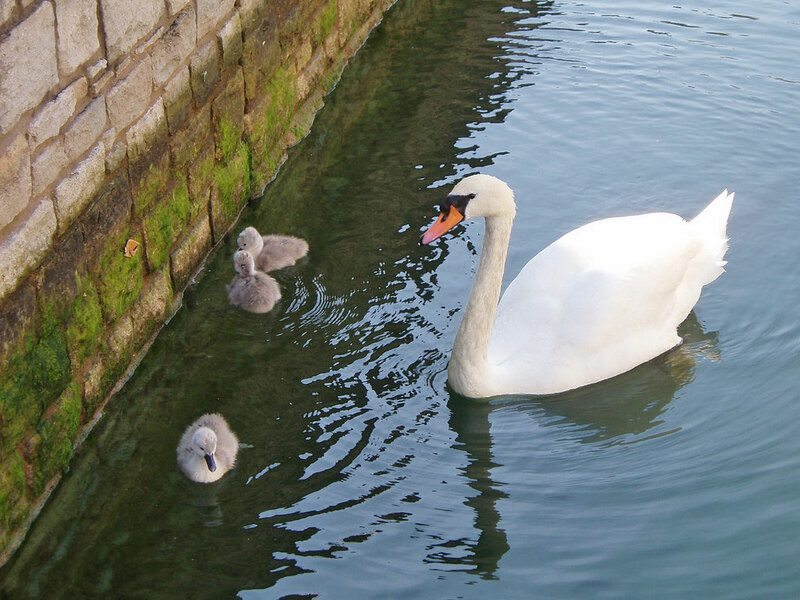 Sometimes the best place for minor limps is for the swan to have some hydrotherapy - by swimming around in a lake or river - so if the swan is already at a lake or river then it is best it stays there and is observed in case it gets worse. Can a swan break your arm or leg? Very unlikely - Swans are powerful birds and are the largest bird in the UK. Unless you are suffering from a condition like brittle bones, are a child, or happen to fall as a result of being hit by a swan, you are very unlikely to break you arm or leg by being hid by a swans wing. They can give you a nasty bruise, their nails on their toes can scratch skin if you pick them up, their beaks can pitch your skin, but that is about it! Be aware that swans are very territorial birds especially when they have their young about, a swans will charge down a river or across a lake if they think you are a threat. It is best to keep your movements slow and keep well clear if you are at all concerned about being near a swan. For more swan advice and information, contact the National Swan Sanctuary on 01932 240 790 or visit their website.